Last week I decided to forego the fast ride and the buxom blonde typically associated with the male mid-life crisis, and opt for the somewhat more sedentary escape of entering the APAT English Amateur Poker Championships, which took place over the weekend of June 29-30 in Coventry. I was visiting my nephew in Salisbury the following week anyway, so it slipped rather nicely into my schedule, and trusting that the planets had aligned in such a manner for a reason, I decided to pony up the not insubstantial buy-in and register. Less expensive than the sports car, and (mindful of how I phrase it) ultimately more fulfilling than an eighteen year-old, I thought a couple of days of poker may be just what I needed to recharge the batteries. Of course, a seven hour drive timed so that I would arrive with about ninety minutes of rope is not the best preparation for ten and a half hours of poker, but that’s just what I did. Somehow, running on instinct towards the end of the night, I made it though to the next day as one of the 36 remaining from the initial 147 entrants. After a fairly uncomfortable sleep in a hotel I would only recommend for the cute Eastern European woman behind the bar, I hit the casino to finish off the tournament. Three hours later there were 15 remaining, and I had been nursing the shortest of stacks for about thirty minutes. Finally my monster hand of 5 3 offsuit was taken down by the eventual winner’s A 10. Can’t complain. I turned a 100% profit on the entry fee. 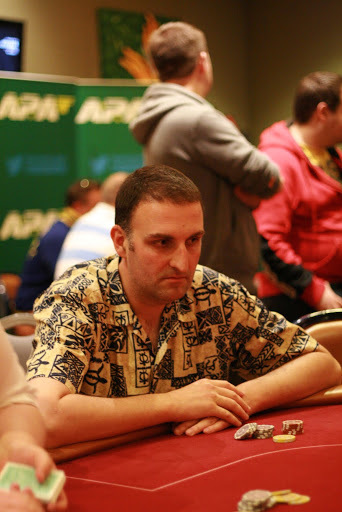 This entry was posted in Social and tagged APAT, Coventry, poker, Salisbury on July 8, 2013 by Brian G Ross. An excellent achievement BEFORE you take into account the lack of food and sleep. Well done, brother.